Known as the "Barbed Wire Capital of the World," and the Rush County Seat, La Crosse was founded by the Missouri-Pacific Railroad in 1876. That same year, the county was re-surveyed, the southern tier of townships transferred to neighboring Pawnee County, and the new townsite of La Crosse was to be found in the exactly center. The land belonged to surveyor, Denman A. Stubbs, and his wife, Ellen, who had moved to Kansas from La Crosse, Wisconsin in 1874. The Stubbs immediately became the first developers of the new city, which they named for their home town in Wisconsin and began selling lots, mostly to young men. Denman Stubbs' brother, Sergeant David C. Stubbs and another man named John R. Kemmermer, also applied for 160 acre patents in 1877 to further develop the town. An election was held to permanently move the county seat to La Crosse in 1877, much to the chagrin of Rush Center citizens. This would start a bloodless battle between the two towns that would take more than a year to solve. In the meantime, the records were moved back and forth several times. Several buildings were erected in 1877 including the first school, a church known as The La Crosse Meeting of The Society of Friends (later the United Brethren Church), the first general store was called Joseph & Parker. E.F. Brown became the first postmaster on April 23, 1877 and other early settlers included P.C. Dixon, S. W. Taylor, O. C. Prescott and M. Burge. The first La Crosse school was erected in 1877. The earliest churches in La Crosse were The United Brethren Church, first known as , established in 1877; The Christian Church, established in 1887; and The Methodist Church. In the spring of the same year, the Walnut Valley Standard newspaper moved from Rush Center, published by W.P. Tomlinson. Another newspaper called the Rush County Progress also moved to La Crosse in the Fall of 1878. Later the La Crosse Chieftain was established by Taylor & Goodwin, beginning on January 1, 1881. County offices were houses in the second story of a stone building on the west side of Main Street and the court in a small frame building next door. But a courthouse would not be built until the wrangling between La Crosse and Rush Center was finally over in 1888. 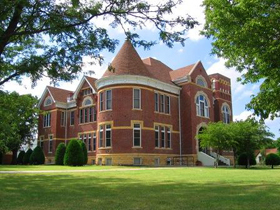 The courthouse continues to stand today, now listed on the National Register of Historic Buildings. As the official county seat, La Crosse began to grow, developing into a prosperous shipping point and supply point and farming community. Wheat, livestock, poultry and dairy products were the main agriculture economy. Later Oil and gas wells became important economic factors. 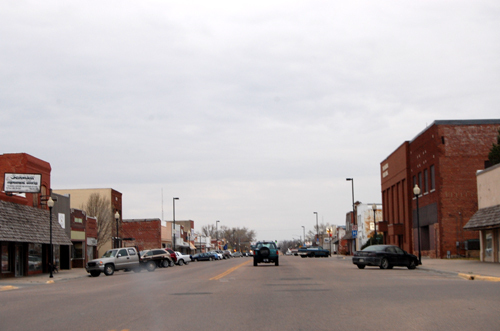 By 1910 there were about 100 business establishments, including two banks, three hotels, two grain elevators, a foundry and machine shop, two weekly newspapers -- the Chieftain and the Republican, an Opera House, and telegraph and express offices. The city was lit with electricity for its some 800 residents of the time. One of the only towns in the county to grow through the 20th century, La Crosse now supports a population of almost 1,300 people. It celebrates its heritage at four museums. The Post Rock Museum, is housed in a native stone building originally built by homesteader Dan Haley southwest of Nekoma in 1883. 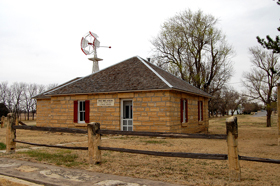 The house was moved to its current location in 1963 preserve the ingenuity and perseverance of the Kansas pioneers. The museum includes an authentic stone quarry re-creation illustrating the methods used to cut posts for fencing as well as tools and items depicting the history of the post rock unique to this region. The museum is located at 202 West 1st Street. The Rush County Historical Museum is housed in the former Timken, Kansas Santa Fe Depot. The building was constructed in 1887 by the Atchison, Topeka, and Santa Fe Railroad to serve this small community in southeast Rush County. When the building was threatened with demolition, the historical society moved it to La Crosse. The museum tells the story of the history of the people who settled in Rush County and houses a large collection of photographs, albums, and scrapbooks, as well as memorabilia, clothing, tools and equipment used by early pioneers. The museum is located at 200 W. First Street. The Kansas Barbed Wire Museum is devoted solely to the history and legend of this part of American history often referred to as the “Devils Rope”. On exhibit are over 2000 barbed wire varieties; including samples manufactured between the years 1870 and 1890. Hundreds of antique fencing tools illustrate the inventiveness of pioneers. the city of La Crosse hosts the Annual Barbed Wire Convention and the Barbed Wire Swap Meet each May. The La Crosse Museums are open seasonally between May and September, but can be seen by appointment at other times throughout the year. Native American Photo Prints - Hundreds of restored vintage photographs of famous chiefs and leaders, warriors, rituals and ceremonies, Native American life, and lots more. Our Native American images are available in a variety of sizes, paper types, and canvas prints. Cropping, color options, and digital downloads for commercial purposes are also available.